How often do you have to clean out the vivarium? Firstly a word about bearded dragon waste matter. Like birds, bearded dragons have solid urate which they pass with their feaces - in other words they don't pee. The urate is the white part of their poo. This means the viv can get messy, but there's no damp areas you need to worry about. When bearded dragons are young they poop two or three times a day. As they get older they poop less often until when adult, it's only once a week or so. As they grow though, so does the size of the feaces - and correspondingly the smell! You'll find it's best to remove poo as soon as you see it. If you use kitchen towel with babies you can just remove the soiled piece. If you use sand you can get a special sieve (or just use a small kitchen one, but remember to reserve it especially for this purpose!) and remove the solid matter with this. Poo on sandstone or tiles should be wiped off as soon as you see it - otherwise it can bake on and be harder to remove. If you keep removing the solid waste then the vivarium can go about three months - or even longer if you keep it clean daily - before having a total spring clean. Obviously the first step before getting your dragon is to make it a home! A vivarium for a dragon is more than a rabbit hutch or hamster cage, it has to be a miniature eco system so the dragon can live as near enough naturally as he would in the wild. For bearded dragons the vivarium is going to have to be large! Bearded dragons will grow up to between 38cm to 60cm (15 to 24 inches). It is recommended that for a single bearded dragon the vivarium should be 120 cm long, by 60 cm wide by 60 cm tall (48 x 24x 24 inches). As you can tell you will need to make sure you have the space to house something this large! Will an old fish tank/aquarium do? The vivarium must not be placed anywhere where it would be in light for 24 hours, or somewhere subject to loud noises, as both of these will cause the dragon stress. In direct sunlight is also not a good idea as it will make controlling the temperatures in summer very difficult. Vivariums can be made, or bought ready made. Your local pet store may well stock them, but you will find the costs very expensive. For example, I was advised to buy a 4ft x 2ft x 2ft vivarium at the cost of £220 from my local reptile store. This almost caused my parents to cancel the project! So we started to look around, and found Ebay an excellent source. Okay, so the vivarium may be second hand, but as long as it is clean, serviceable and pleasant to look at, does it really matter? At £82 my 5ft x 2ft x 2ft vivarium seemed a real bargain! 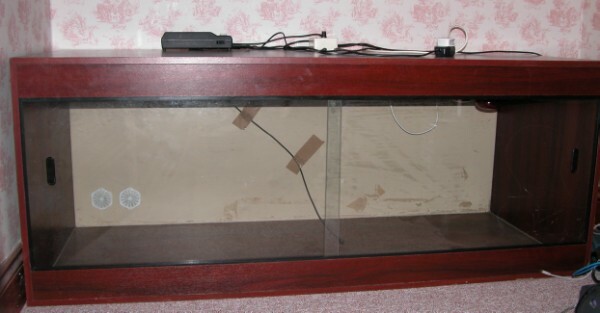 This is my vivarium as bought from Ebay. Not only was it a lot cheaper than new shop bought models, it came with a Habistat dimming thermostat (worth £48), flourescent light, starter and two heat bulbs. This will save me a lot of money. It may not look very pretty at the moment, but if you check out the accessories page you will see how I made it ready for the beardies! Will an old fish tank or aquarium do? Vivariums have the advantage that the front has sliding doors. This makes it easier to clean, feed, and take your pet in and out. A fish tank is perfectly acceptable, but you will have to leave space above it as you'll be reaching over and taking care of your beardie through the top. As baby beardies can be frightened by something hovering over them (they think it's a big bird about to eat them) when your bearded dragon is new make sure you put your hand in the opposite end of the tank and then move your hand towards him to pet him or pick him up. They'll soon get used to you. Should I buy a complete Bearded Dragon Set Up or starter kit? Many new members on the forum ask whether they should be buying a complete bearded dragon set up from their local pet shop or online store. I've yet to hear of one that is totally suitable for a bearded dragon. Some offer vivariums which are too small or unsuitable. Some come with heat mats, and most with a totally unsuitable substrate. I advice that you read this site and posts on the forum and complete a list of everything you think you need. If the complete set up includes everything and is a good price then buy it. If it doesn't, then don't. It is best to get your vivarium set up and ready to go with all heat and lighting installed at least a week before you get your bearded dragon. This will give you time practicing with the heat and lighting, and making sure that you get the temparatures exactly right to give your new pet the best start in life! It takes about a week for the temparatures to properly stabalise. You may want to consider building a vivarium - this isn't too hard to do, and you can get the wood and glass ready cut to size for you at many places. There are a number of descriptions of how people went about building their vivariums on the mybeardeddragons forum.